Prepare for the return of "Aca Live." It's been nearly two months since our last live-streamed a cappella segment "Aca Live" and we've been anxiously awaiting the right moment to feature another exciting group. Well, we have just the right act for you. Hailing all the way from the UK, our next featured guest will be none other than King's College London's The Rolling Tones. Back in April, this all-female vocal force was crowned the 2017 Voice Festival UK champion. Since then they have been releasing incredible videos from recent performances and gearing up for some major European gigs. We are ecstatic to welcome our very first international guest for this segment. You can see them live this Sunday at 4 PM/PST on our Facebook Page. Be sure to check out The Rolling Tones history, their thoughts on how the UK and US aca-scenes, and what they have planned for the future in the below interview. 1. Can you tell me about the group's founding? When did the group begin? Any specific influences, past or present that you all can point to that inspire(d) your style? The group started as The King’s Chicks back in 2007, but The Rolling Tones as we are known today is the result of a rebranding in 2014, spearheaded by our then-MD Zara Tso. I’d say it’s more of an idea than an influence that has shaped us-that we aim to be a good a cappella group, and not just ‘good for an all-female group’. 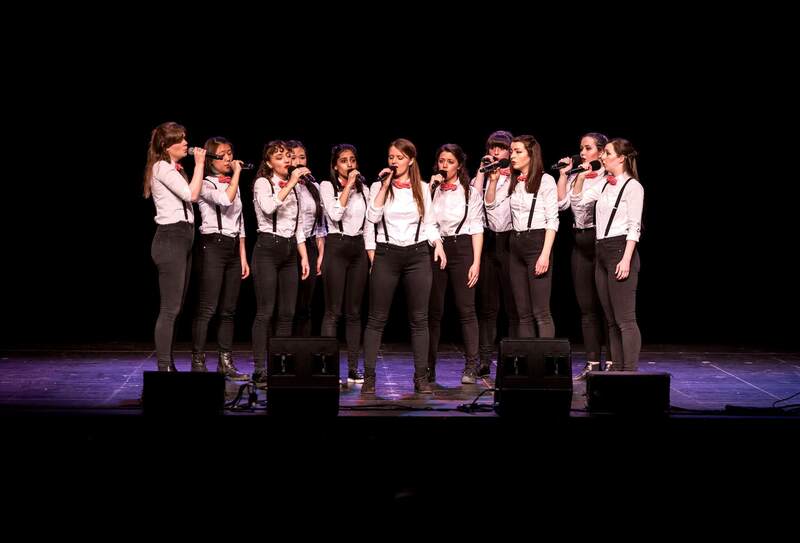 All-male groups have traditionally dominated, and there are narrow confines on what all-female groups are expected to do, so we aim to push boundaries and shatter glass ceilings (as we have done with being VFUK’s (Voice Festival UK) first and only all-female winners in its 10 years of existence) and produce a unique and professional sound. 2. What makes The Rolling Tones so special? What makes members join the group versus looking into other student organizations? By virtue of being the only all-female group at our university, we are pretty special. That aside, I do think we stand out quite a bit because of our style (visually and musically) is quite different from any other university group in the UK (that I know of). Of course, we always lose a few to musical theatre. But the best story was of someone who’d applied to King’s College London specifically to be able to audition for us (don’t worry-she’s a current member now and she’s fantastic). I asked the girls and got answers ranging from when we did a gig after we won VFUK with last year’s winners The Bristol Suspensions that was 0% pressure and 100% fun, to the moment we won VFUK and it was totally unexpected for us. But for me, it was our ICCA quarterfinal encore performance of Sara Edward’s arrangement of Teardrop by Massive Attack. It was-by far-not our best performance; we worked really hard and improved loads by the time competition season in March/April rolled around. However, for a lot of the group, it was their first time competing in an a cappella competition. Also, since it was our first time competing in the ICCAs and we don’t usually use mics, and we didn’t really know what to expect. We were really nervous about not qualifying! We hardly expected to win our quarterfinal with 420 points, the highest score ever attained by a group in the UK so far. It was incredible being able to get back on stage to perform the encore, and when our amazing soloist really went for it with such power in her voice, the crowd went wild. I think I forgot half the choreo, but it was incredible. 4. What are the Rolling Tones doing to stay relevant in the aca-community? Videos, events, grassroots campaigns, etc.? To be honest, the best way to showcase a cappella talent in the UK is at competitions, and this is also where we (try to) make friends with other groups. There’s so much love and appreciation for each other in this community, which also include alumni from all the groups in the UK. It’s more about building good relationships with aca-friends and fans alike, rather than thinking of relevance as the main thing. This year, we got to share stages with the Techtonics and The Bristol Suspensions, and over the past few years, we’ve sung with The Scopes and All The King’s Men. That said, recently, more groups have been recording singles and putting out music videos, so we’re hoping to move in that direction too. We’re just about to head up to the Edinburgh Fringe Festival for the first time ever with a show called Bows and Braces! This livestream is actually of our preview show called Brace Yourself (ha), to be able to give people the chance to catch us doing a stripped down version of our Fringe set if they’re not able to catch us in Edinburgh, and also to raise money for our journey to the north. We also have a single and music video coming up, so stay tuned for that too. In my first year in the Tones, the then-MD threw up on stage when we were competing in VFUK. No joke. She hid it so well that we didn’t even notice, and just carried on. We made it to the finals-the only all-female group in the finals that year-and she won Best arrangement at the semi-finals and finals for her arrangement of Awake My Soul by Mumford and Sons (it wasn’t this song she threw up in). 8. Back in April, you all were crowned the 2017 Voice Festival UK Champions. How did The Rolling Tones get involved with this event, and what was your preparation like? What does it mean to you all personally to be this year’s champs? We've competed in VFUK before, reaching the finals twice before finally winning it this year. It's been many hours of blood, sweat, and tears; loads of reworking arrangements, nitpicking, yelling, and snacking, and we couldn't have done it without all the hard work of each and every member of the group as well as the people who have supported us along the way (We love you Jon Smith!). Winning VFUK this year has been incredible. We're so honored to be able to bear the title of first all-female winners! It really means a lot to us and we look forward to other all-female groups taking on this trophy too! Personally, it was an amazing experience starting from my first VFUK as a shy baby Tone, to heading up to VFUK for the third and last time as a King’s student, and just being surrounded by friends and familiar faces from all over the UK-then actually winning it. 9. Most of the groups we feature on our site are based in North America, so we’re always excited when we get to speak with an international group. One thing we’ve noticed is that UK-based aca groups are still rehearsing, performing and even taking part in shows like “Pitch Battle” while American groups are on Summer break. Do the Rolling Tones operate year-round? What’s your typical academic and performance calendar look like? To be honest, this year is the first year we're working through the summer! It's keeping us really busy. A lot of groups perform at the fringe, which is what we're doing too, and that necessitates rehearsals in the summer. However, we were keen to keep going in the summer. We're at our peak by this point-we've built our repertoire, put in the hours for the competitions and the gigs along the way, and have become such good friends-and it's such a pity to disperse as soon as summer hits, so I’m glad we’ve got Fringe to look forward to. In general, we have Christmas concerts, and Easter is competition season. 10. What’s the aca-scene like not only on the campus of King’s College London, but in the UK as well? How would you describe the culture? Are groups open to working together, is it super competitive, etc.? Have you noticed any differences from the American scene? In contrast to American universities who seem to have plenty of a cappella groups, we only have two: us, and All The King's Men. We've put on Christmas concerts, performed as opening acts for our university's theatre productions, and sung at university events like the KCL Widening Participation Gala, and fundraisers for King's charities like Think Mental. We also sometimes rehearse in stairwells or the main foyer-where there's excellent acoustics-which counts as adding to the scene, I guess. The scene in the UK is great. There are so many excellent people with such exceptional talent. We're like a huge family; it's great. Alumni are really supportive. Competition is friendly, and are great (and rare!) opportunities to be able to meet our friends from other parts of the UK. It's always such a privilege to watch other groups' incredible competition sets. We love singing together and hanging out with each other. We recently had an aca-picnic and at least 10 different groups were represented there. A member of Accent even graced us with his presence. America's scene seems to take it way more seriously and I get the impression it can get pretty competitive... at the end of the day we just like singing with our friends, and watching our friends sing. There's also an excellent discussion thread on the CASA group from a while back where we debated out the difference in US vs UK style a cappella. The fact that VFUK is off mic and the ICCAs isn't already makes a huge difference, along with the judging criteria of the ICCAs, which is also very American. I get the impression there’s more focus on performance and theatrics. There’s something quite special and valuable about UK a cappella style, and I hope UK groups will be able to treasure and develop it! I will unabashedly say the most rewarding part is the friends you make along the way. Spending six hours a week singing and snacking together (and competing together) really helps build friendships like no other. All the inside jokes and banter, all the unwavering love and support-it's incredible. University can be a really hard time, especially for freshers who are having to find their feet in an entirely new environment, and having this support network really helps. The most challenging aspect is juggling a degree and a cappella on the side. Sometimes it feels like juggling a cappella with a degree on the side. Our uniform was the brainchild of Caroline Roseberry Koktvedgaard, and it’s a nod to barbershop or ‘stereotypical’ a cappella. It also fits in with the fact that while we are an all-female group and that’s important, we just aim to be good at what we do; we don’t try to be more like the all-male groups, and we refuse to fit in the narrow boundaries of what is expected of a ‘good female group’. This was a concert back in March which we hosted. It started out with the SoCal VoCals contacting a bunch of groups in London about their upcoming spring break trip, and we managed to put together a concert with them and the Techtonics in a cool venue called The Vaults under the train tracks of Waterloo station. It was such a fun night; so many of our friends from other groups and other groups' alumni came down to watch, and we totally sold out the event! It was also such a privilege to be able to watch the other groups live. For more information on The Rolling Tones, connect with them on Facebook, Twitter, YouTube and Instagram.